In order to understand the plasma-chemical processes it is necessary to investigate physical and physico-chemical properties of the used electrical discharges, with respect to the specific application. Measurements of the electrical parameters of the discharge represent a standard diagnostics method. Optical diagnostic techniques is widely used for plasma diagnostics as non-invasive and in-situ method. We extensively apply this powerful technique to diagnose all of our cold discharge plasmas. 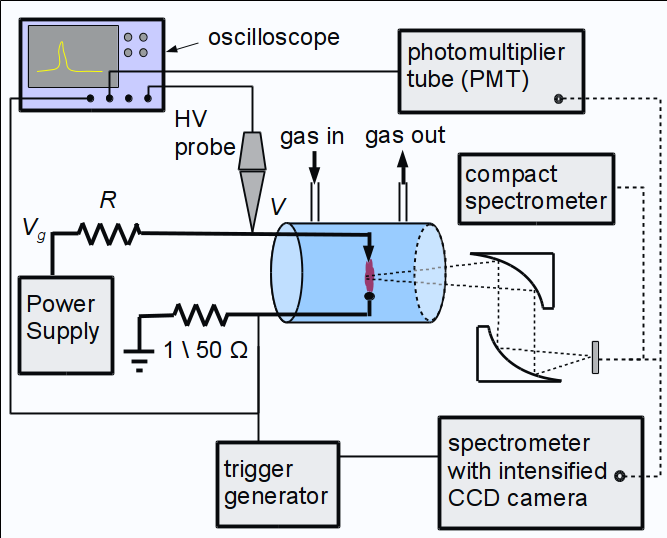 The schematic of the experimental set-up for the optical and electrical diagnostics of DC and AC discharges is shown in Fig. 1. Used electrical and optical diagnostic techniques are described in details in next subsections. Besides the plasma diagnostic, we also perform post-discharge analysis of treated gases and liquids. These techniques are described in sections 2.2 and 3.2. Fig. 1. Experimental set-up for DC and AC discharge experiments and emission spectroscopy. The light emitted from the discharges is lead through the optical system and focused on the entrance of the optic fibers (Fig. 1). A two-channel emission spectrometer Ocean Optics SD2000 (200-500 nm, spectral resolution 0.6 nm; and 500-1100 nm, resolution 1.2 nm) is used. Alternatively, for much better spectral and temporal resolution necessary to track the nanosecond-short time scale processes occurring in the transient spark pulses, we use a 2-m monochromator Carl Zeiss Jena PGS2 covering UV and VIS (200-800 nm) and providing spectral resolution of 0.05 nm. This is equipped with an intensified CCD camera Andor Istar for nanosecond temporal resolution. The optical system also comprises filters, off-axis parabolic and planar mirrors, irises, pinholes, and fiber optics. The discharge chamber and the optical components are mounted on translation stages, which enable lateral and vertical scanning capabilities. OES provides valuable information on excited atomic and molecular states. 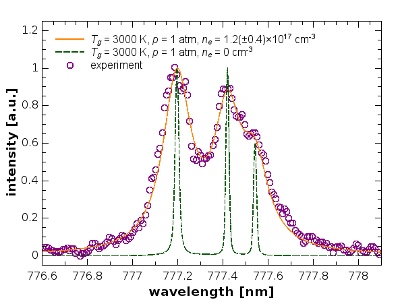 Comparing experimental and simulated emission spectra enables to determine the rotational, vibrational, and electronic excitation temperatures of the plasma and thus the level of nonequilibrium (based on the measured rotational and vibrational temperatures) and the gas temperature (as the rotational temperature that is close to the gas temperature owing to fast collisional relaxation at atmospheric pressure), and sometimes even the electron temperature. In addition, OES enables us to identify many radicals and active atomic or molecular species and so gives insight in the plasma chemical processes (Figs. 2a and 2b). This enables understanding and optimizing the air or water pollution control processes. Identification of radicals is also of great importance in biological and medical applications in order to understand the mechanisms of bio-inactivation and of the plasma interaction with living cells. Excited states are produced mostly by collisions with energetic electrons, and therefore it is assumed that optical emission can provide a measurement of the plasma active size. This is important in plasma shielding and other applications and also enables calculating basic discharge characteristics and so provides understanding of the physical mechanisms. Fig. 2. 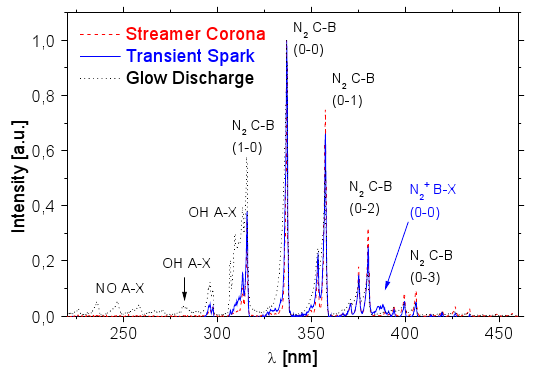 Typical emission spectra of DC discharges with water electrode in UV (a) and VIS-NIR (b) regions (corrected for the spectrometer’s spectral response). Optical emission spectroscopy can also be used for the electron density (ne) measurement in plasmas. The most common OES method for the ne measurement is based on the Stark broadening of atomic emission lines (Fig. 3). Hydrogen-like lines are the most sensitive to Stark broadening and they are the most commonly used. However, the most intense atomic lines in the atmospheric pressure air plasmas are typically the lines of atomic oxygen and nitrogen. Moreover, the difficulty with the Stark broadening is that it depends not only on ne but also on electron temperature Te. We measured the electron density evolution during the spark phase of transient spark (TS) from the Stark broadening of Hα line, N line at 746 nm, and O triplet line near 777 nm. Reasonable agreement between electron densities calculated from the Stark broadening of these lines was obtained for Te = 10 000 K.
Fig. 3. 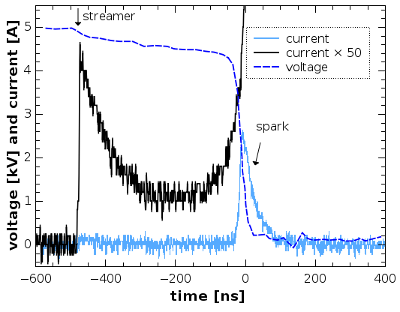 Experimental and simulated spectra of O triplet emission line, repetition frequency 2 kHz, 70 ns after the rising slope of the transient spark current pulse. The time-resolved imaging can also contribute to a deeper understanding of the electrical discharges. It can provide information about the various discharge characteristics, such as propagation velocity, branching, or thickness (Fig. 4). 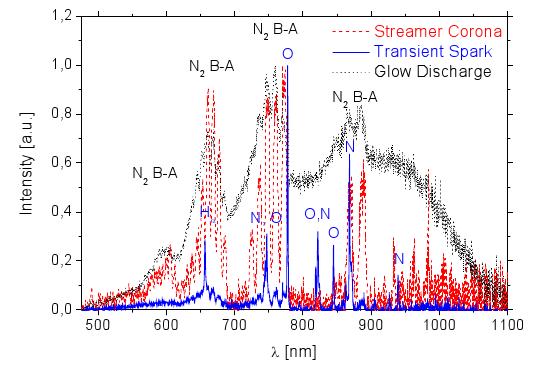 Fast changes of plasma properties in streamers or short pulsed discharges such as TS imply high demands on their optical imaging. Time-resolved technique with time resolution in the order of 1 ns (or better) must be used. This can be accomplished by using intensified high speed CCD cameras for the detection of light. Fig. 4. 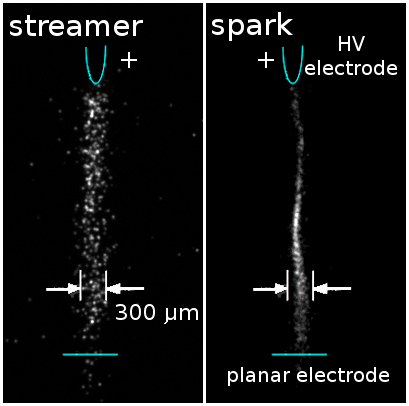 Images of the streamer and spark of a single TS pulse taken by iCCD camera, exposure 25 ns, repetition frequency 2 kHz. 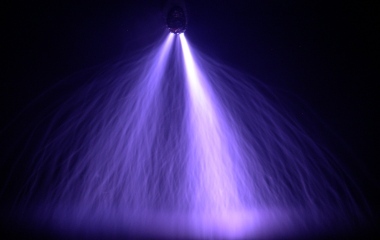 We also used imaging techniques for studying of the electrohydrodynamic spray of water by streamer corona discharge (see section 1.8), for the visualization of the He plasma jet (co-operation with the team of Joanna Pawlat, Lublin University of Technology), and for the research of discharge propagation in capillaries (collaboration with Pierre Tardiveau, University Paris-Sud). The discharge voltage is usually measured by an HV probe, for example Tektronix P6015A. The discharge current we usually measure on a shunt or by current probe, for example Pearson Electronics 2877 (1V/A). Both voltage and current signals are recorded by a digitizing oscilloscope, for example Tektronix TDS2024 (200 MHz bandwidth, 2GS/s). Fig. 7 shows typical voltage and current waveforms of transient spark discharge. Fig. 5. Typical voltage and current waveforms of transient spark discharge. Repetition frequency around 3.5 kHz, current measured on 1 Ω and 50 Ω shunts. The oscilloscopic current and voltage measurements and a detailed analysis of the TS electrical circuit parameters enabled us to obtain the temporal evolution of the plasma conductivity in TS discharge. With the knowledge of electron collision frequency and plasma dimensions, we were able to derive the temporal evolution of electron density in the TS discharge from the plasma conductivity. The electron collision frequency was calculated by Monte Carlo simulations of electron dynamics, while the plasma dimensions were obtained by time-resolved imaging using a high-speed iCCD camera (subsection 1.2.2). The electron density derived from the plasma conductivity was compared with values obtained by optical emission spectroscopy from the Stark broadening of atomic lines (Fig. 5), and used for the validation of chemical kinetic model of the TS discharge.